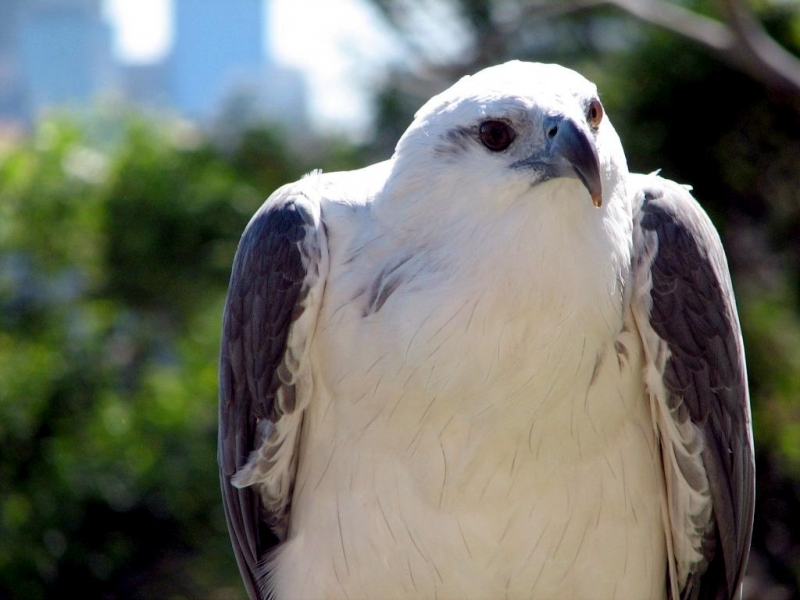 White-Bellied Sea Eagles are large gray & white raptors that live from southeast Asia to Australia and Tasmania. 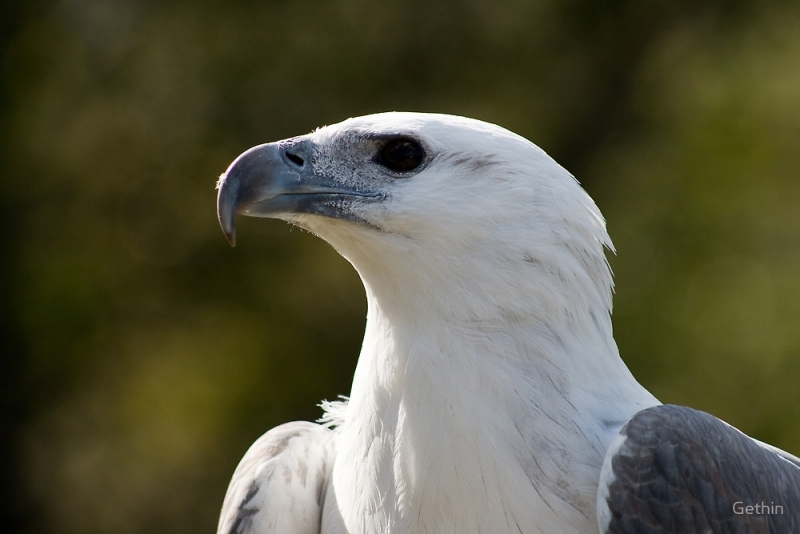 They occur in a range of habitats and have a highly varied diet. 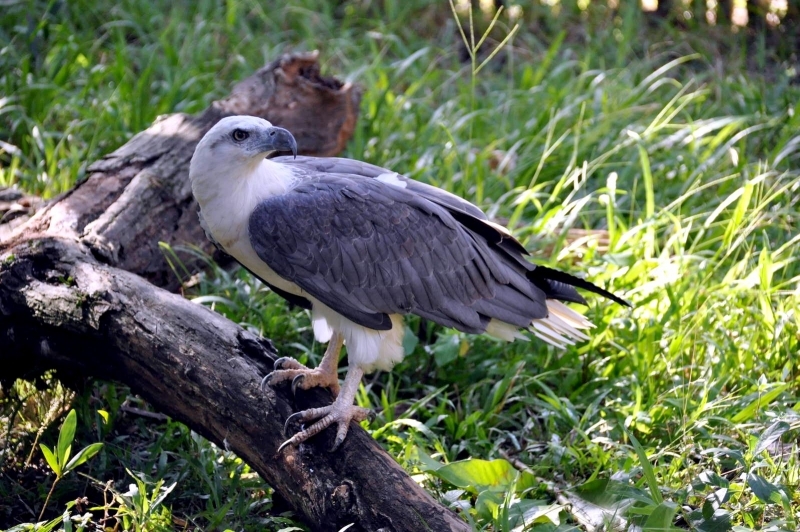 White-Bellied Sea Eagles have a gray-brown back and wing coverts and are white along the head, neck, tail, underside and thighs. 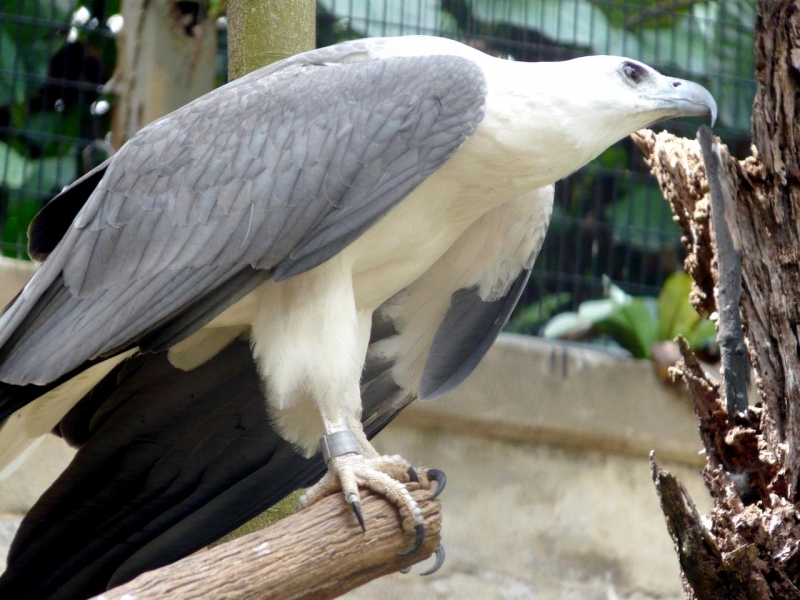 The primary feathers and tail base are black. 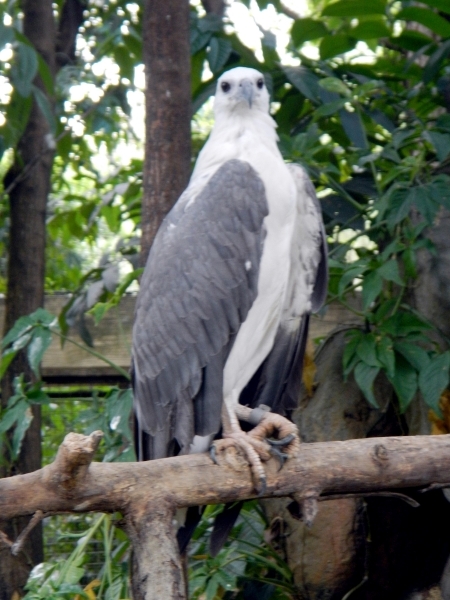 The eyes are black-brown, the cere and lores are blue-gray; the tarsi are unfeathered. 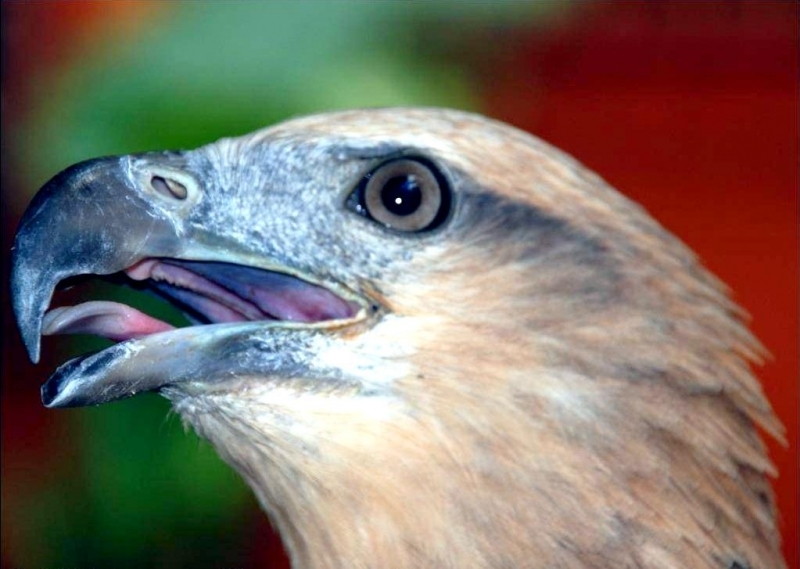 Their beak is large in proportion to their narrow head and the neck & wings are long. 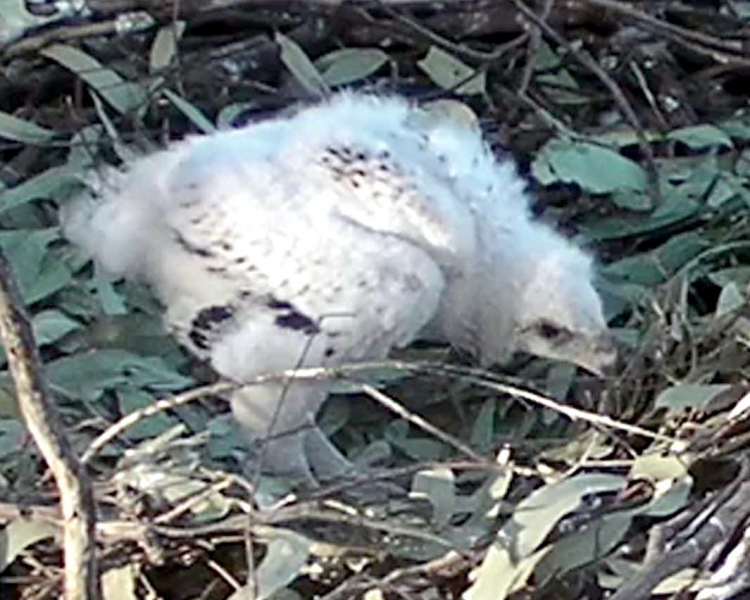 Juveniles are dark brown from above and have a cream-colored head with dark brown stripes behind the eyes. 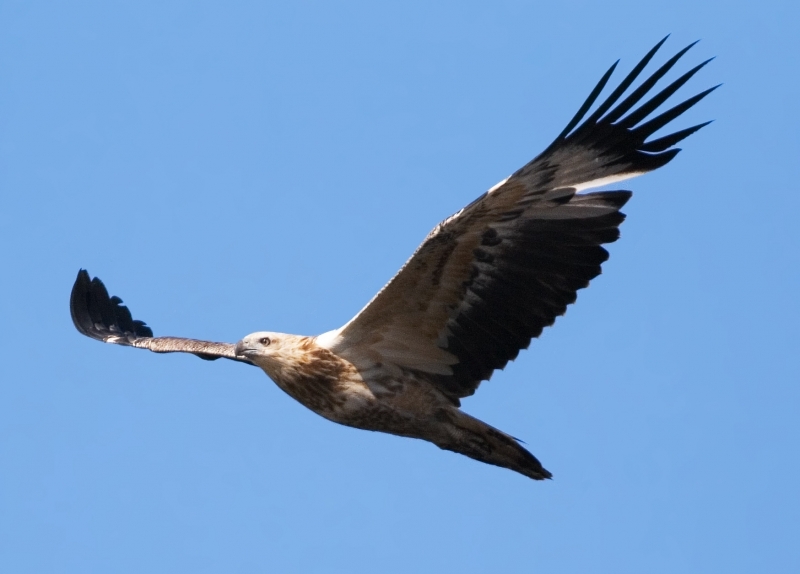 There is buff streaking along the back and shoulders. 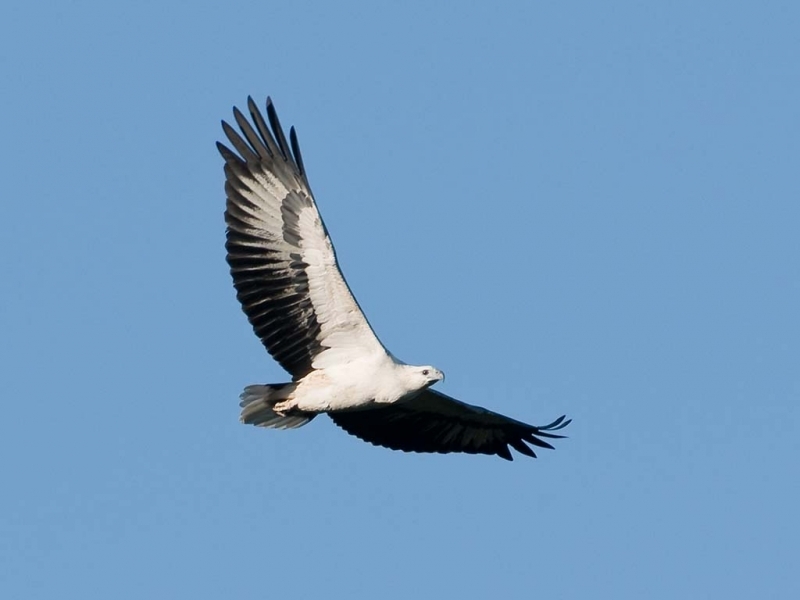 The tail is white with a black sub-terminal band & dark brown underside and there are light wing panels across the greater & inner-wing coverts. 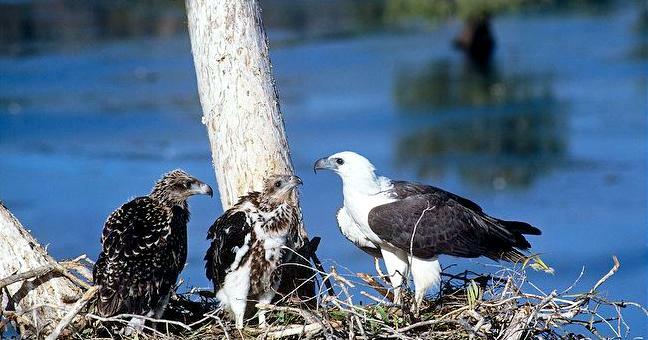 Juveniles reach full adult plumage after 5-6 years, which is around the time they begin breeding. 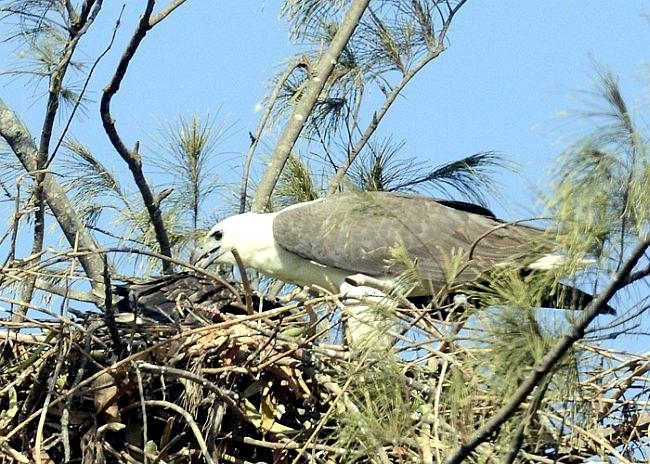 White-Bellied Sea Eagles are noisiest before they lay their eggs, particularly in the morning and at dusk. 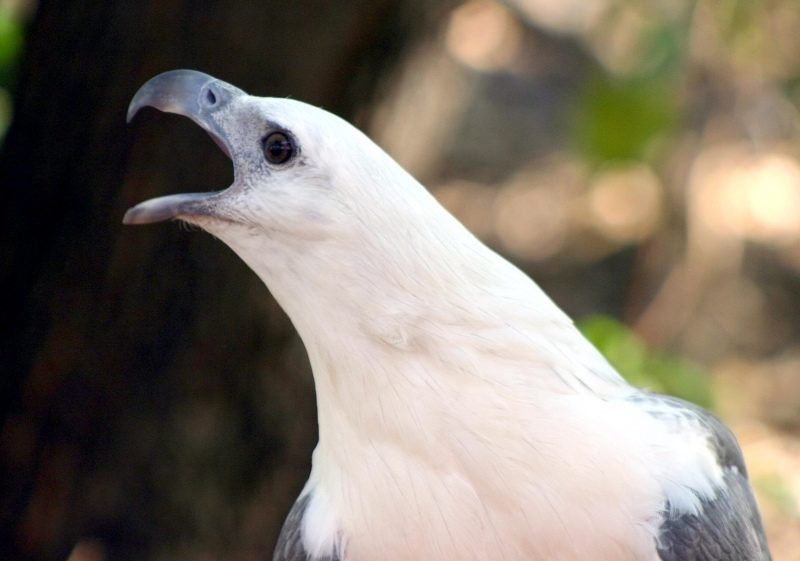 Their call is a loud & honking “ank ank ank” and in courtship, a faster “ka ka ka”. 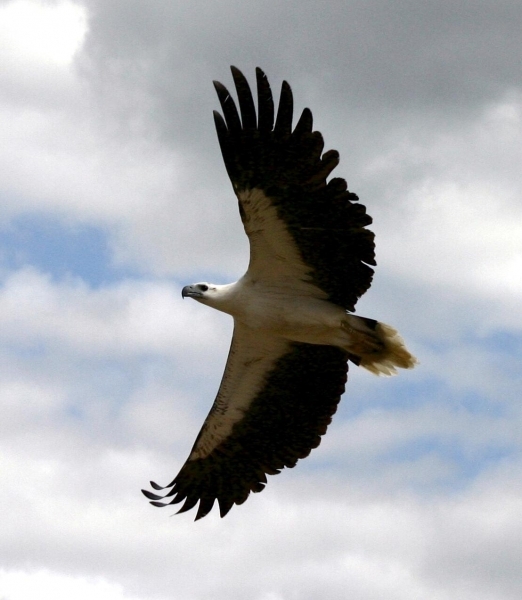 Their maximum lifespan is around 30 years. 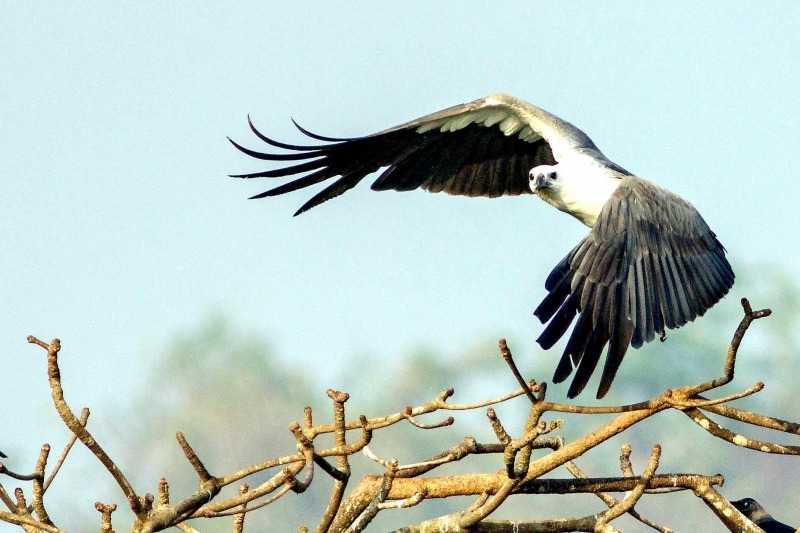 They have been recorded in coastal habitats, estuaries, lakes, artificial reservoirs, riverbanks, swamps, billabongs, sewage ponds, grassland, woodland, rain forest and urban areas. 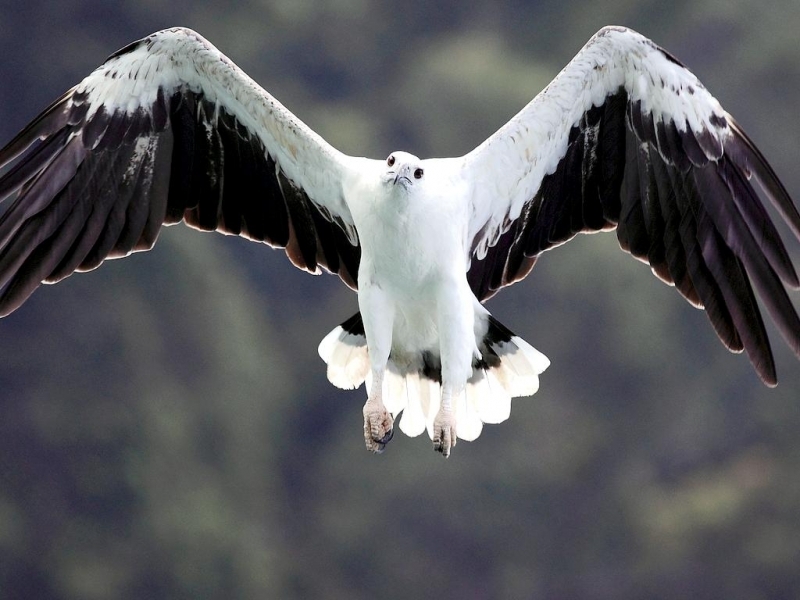 They usually live from 1 to 900 meters above sea level but have been recorded as high as 1,700 meters in Sulawesi. 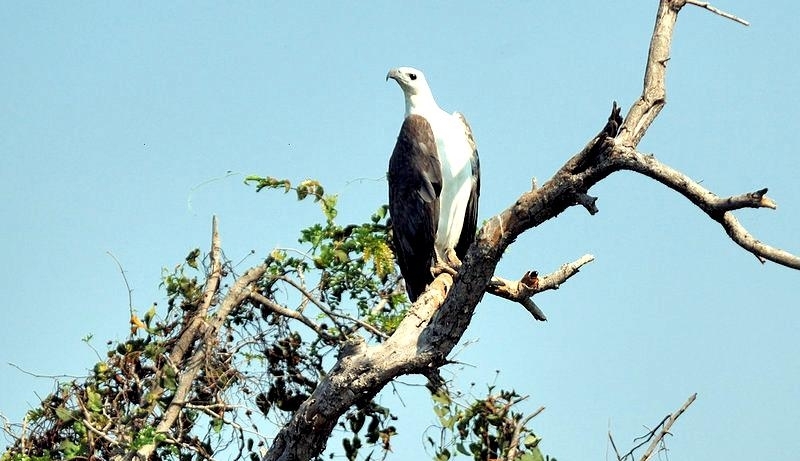 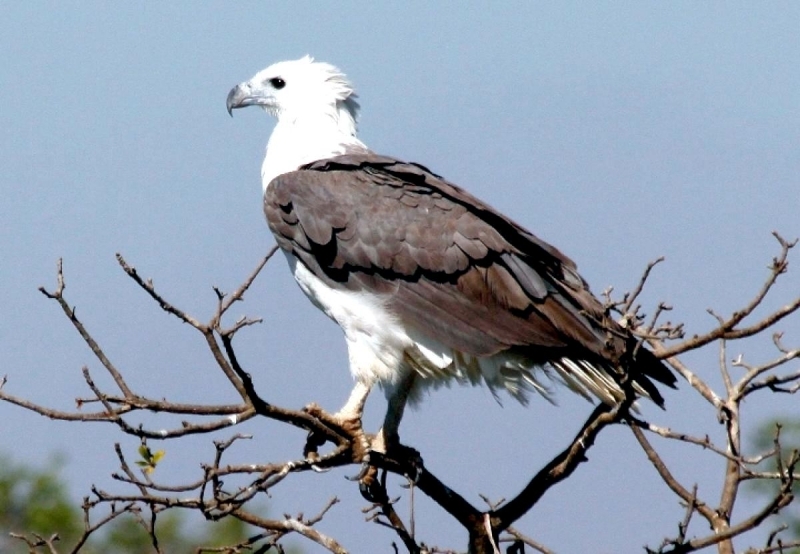 White-Bellied Sea Eagles inhabit India, southern China, southeast Asia, Indonesia, the Philippines, Papua New Guinea, Australia and Tasmania from 26°N to 44°S. 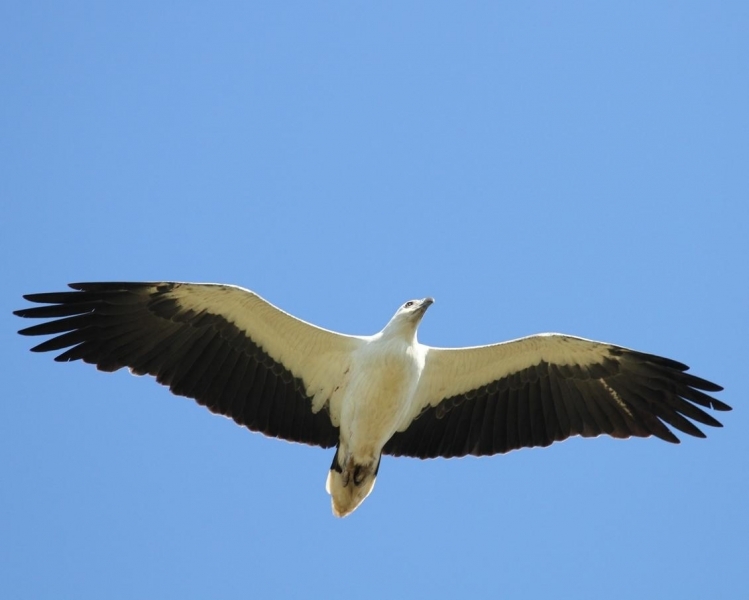 Adults are irruptive or local migrants and juveniles disperse from breeding areas, traveling up to 3,000 kilometers from their nesting sites in Australia; a few breeding adults along southern inland rivers of Australia migrate during the winter. 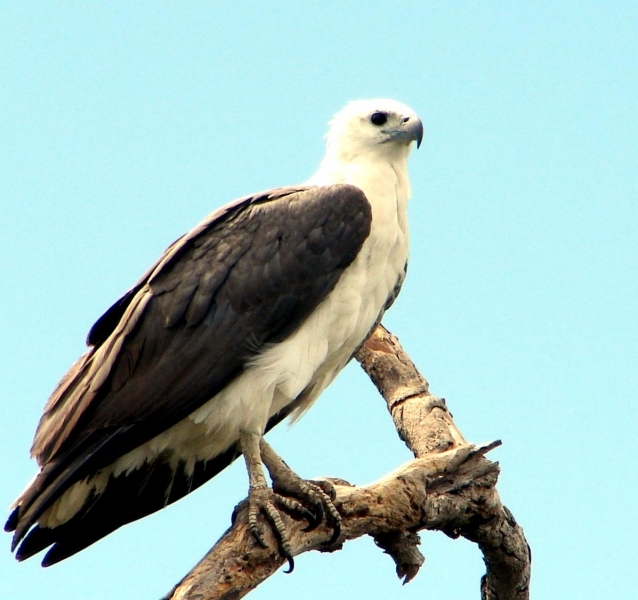 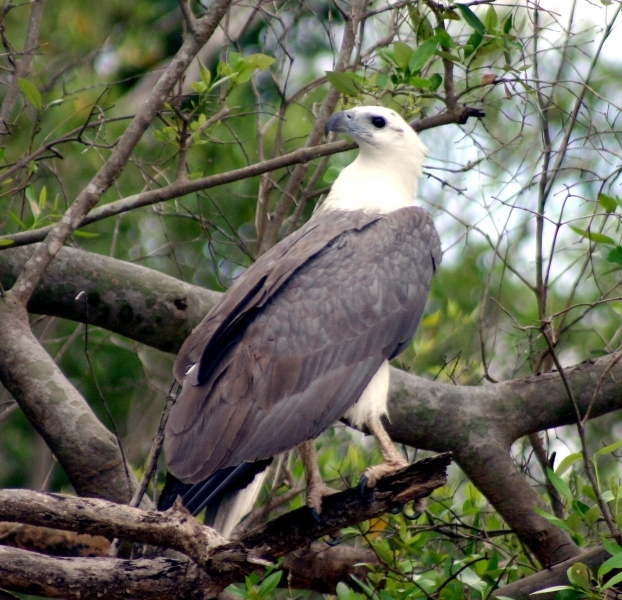 White-Bellied Sea Eagles have a large diet that includes reptiles, fish, birds, mammals, crustaceans, offal, floating refuse, carrion and human waste. 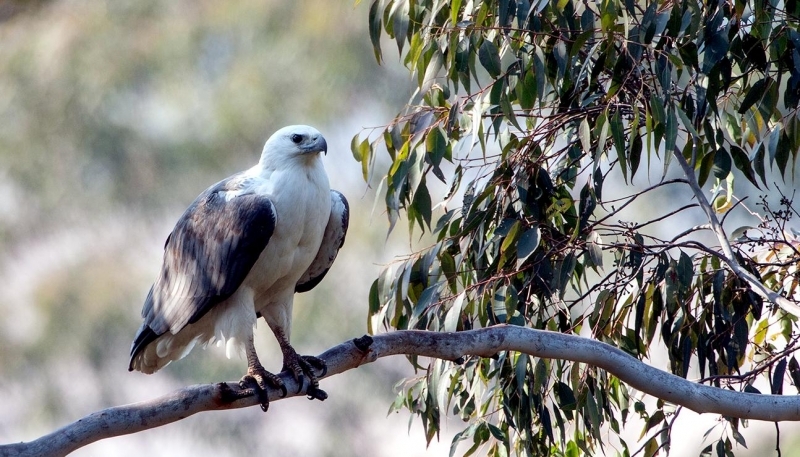 Reptiles include snakes, turtles and tortoises, birds include gulls, terns, cormorants, ducks, geese and chickens and mammals include bandicoots, wallabies, rodents, rabbits and fruit bats. 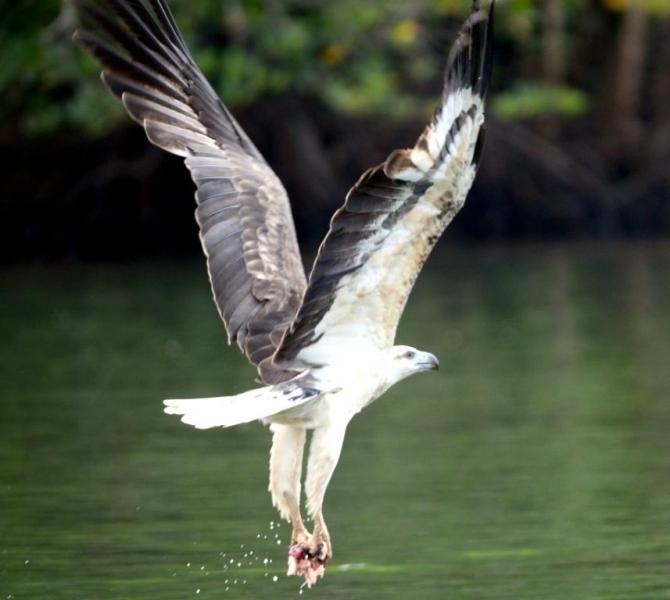 They also prey on poisonous fish & sea snakes. 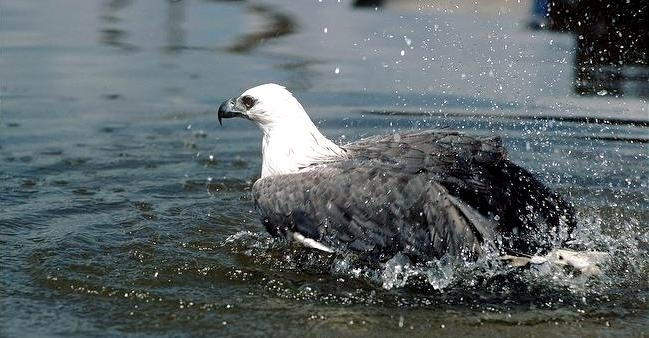 They still-hunt from a perch or soar 10 to 20 meters above the surface of the water to forage for food, though rarely breaking the surface of the water when catching animals—unlike some other birds that submerge completely. 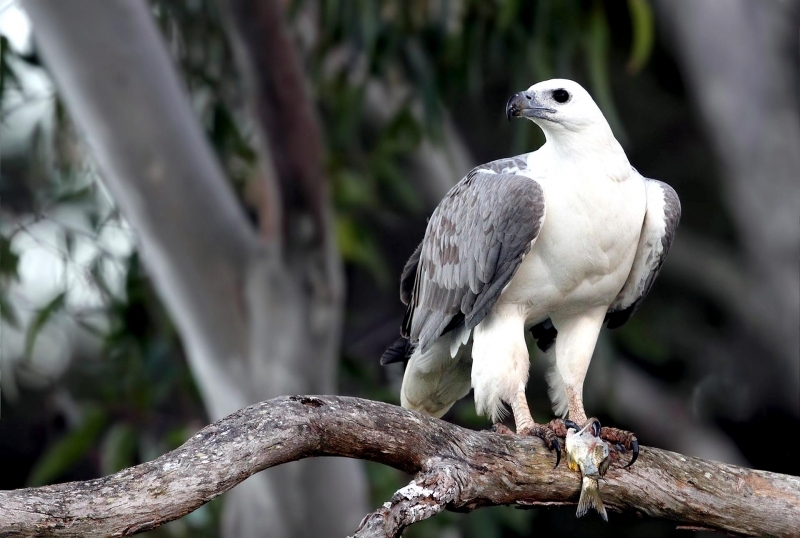 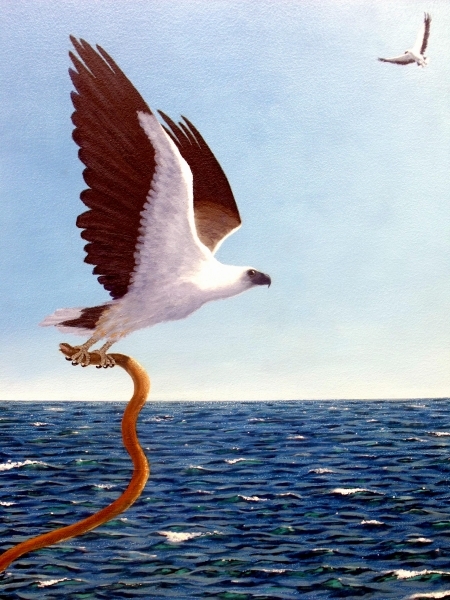 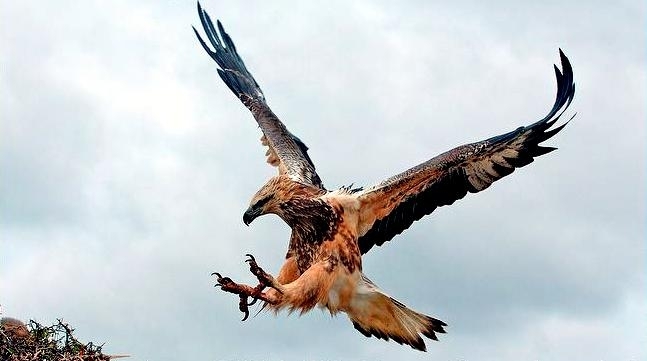 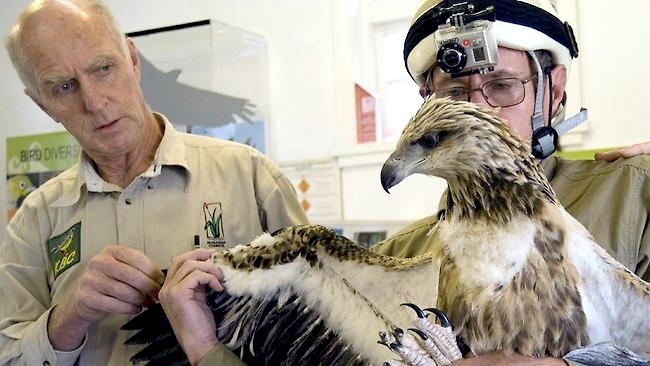 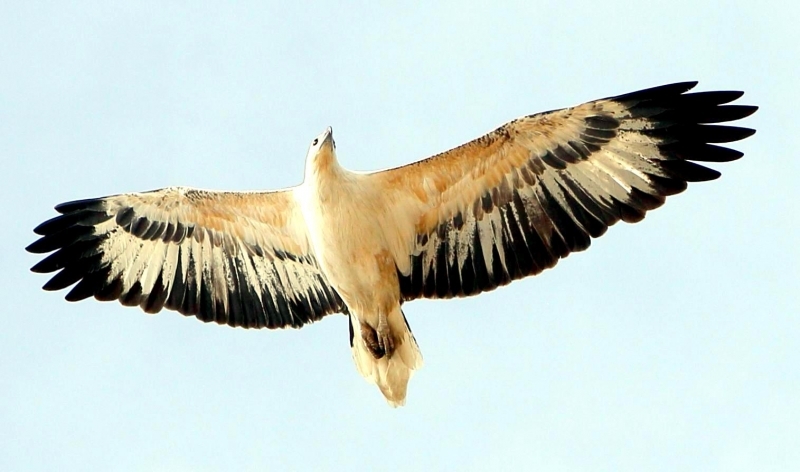 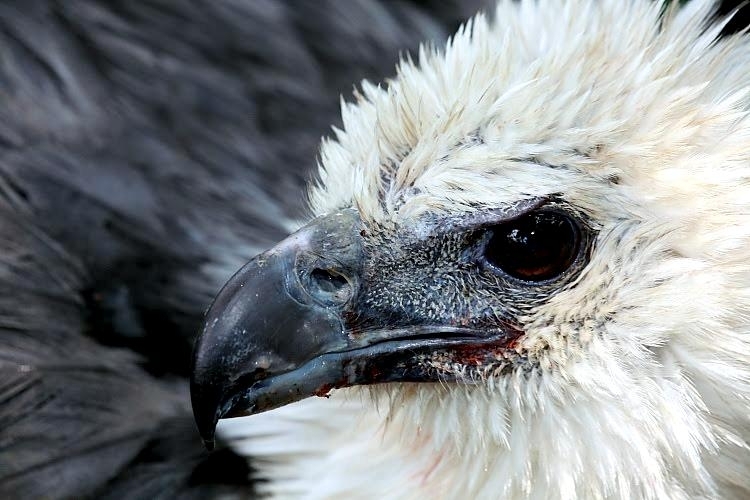 Kleptoparasitism is common behavior as with many other eagles and they steal prey from Ospreys, Kites and other White-Bellied Sea Eagles. 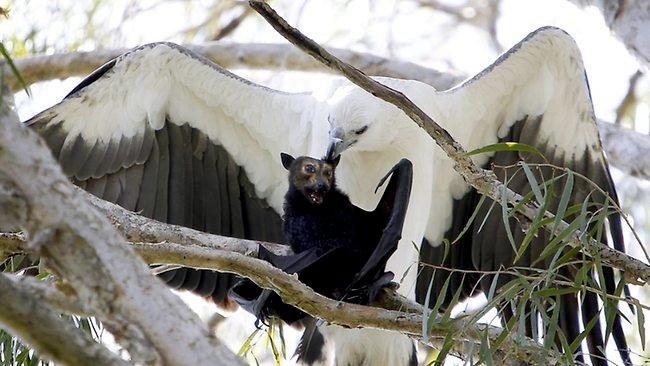 Occasionally they hunt cooperatively. 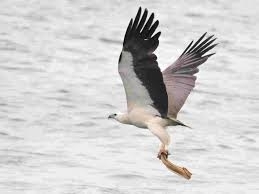 They are also known to follow dolphins for prey disturbed by their passing and to drop crabs from 30 to 40 meters in the air to break open their shells. 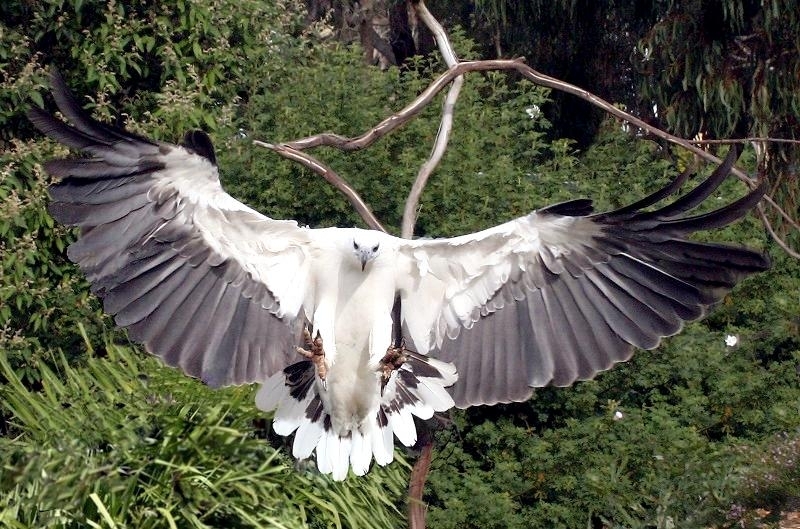 Breeding displays consist of high & low circling, chases, dives, somersaults, claw-grappling and cartwheeling. 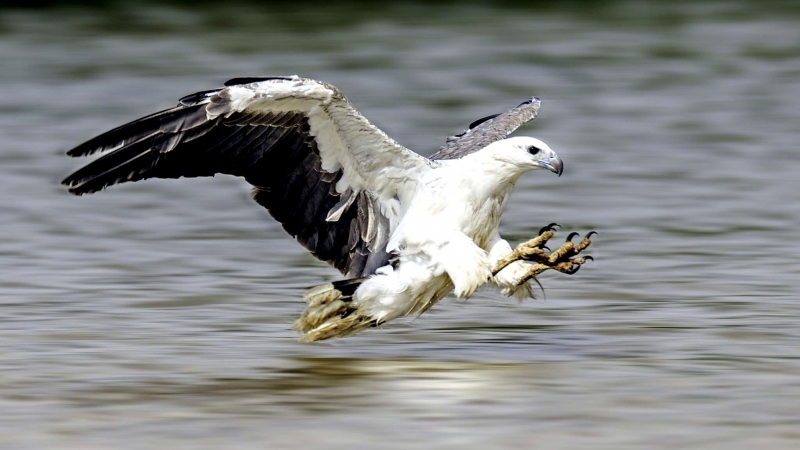 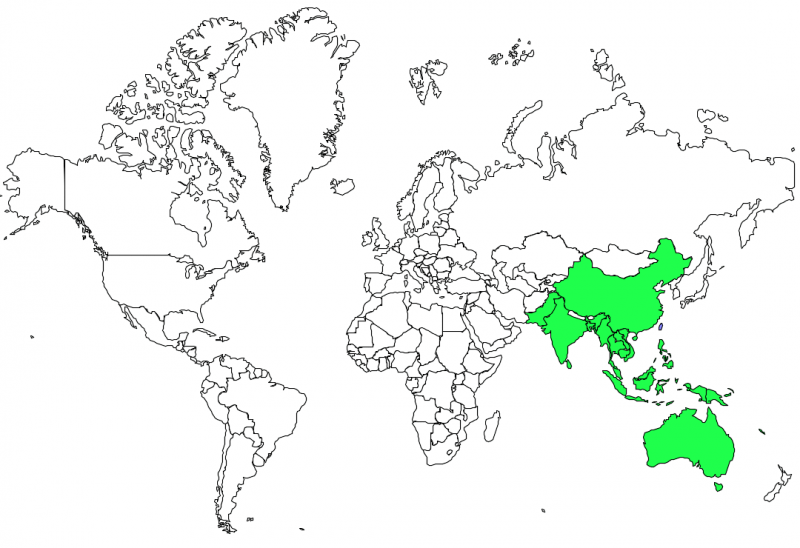 The breeding season is from October to March in India, December to May in southeast Asia, the Philippines and Borneo, May to November in New Guinea and northern Australia and June to December for populations further south. 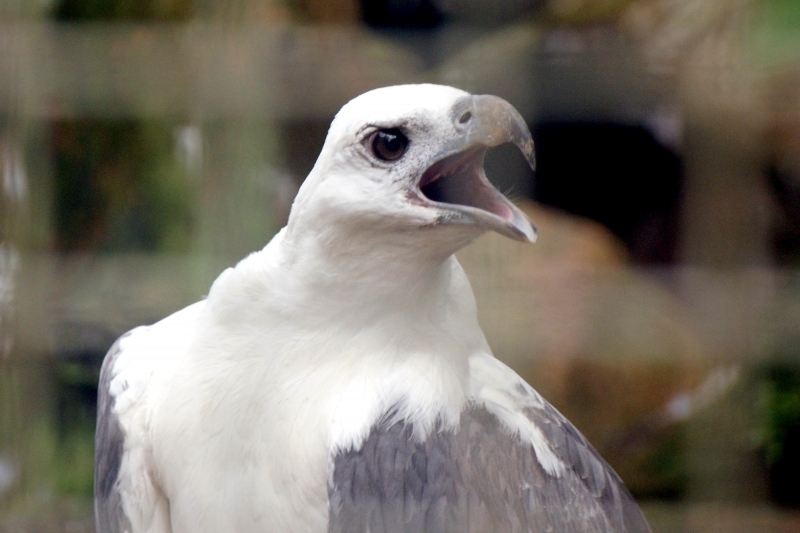 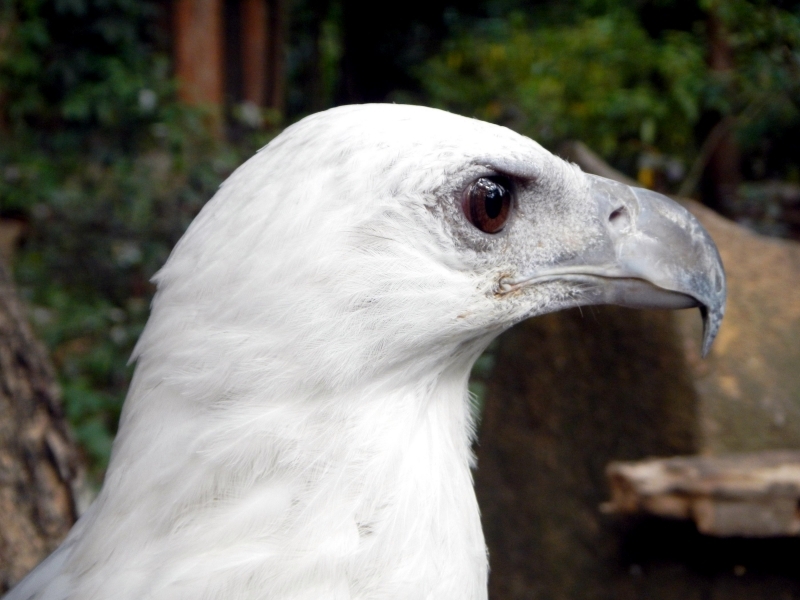 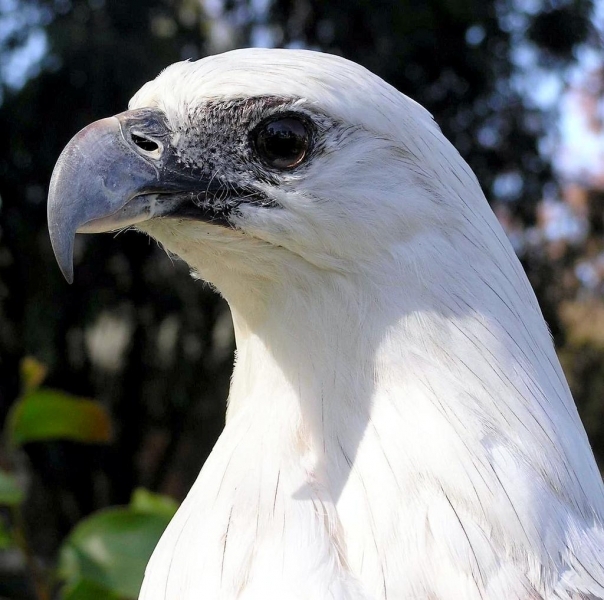 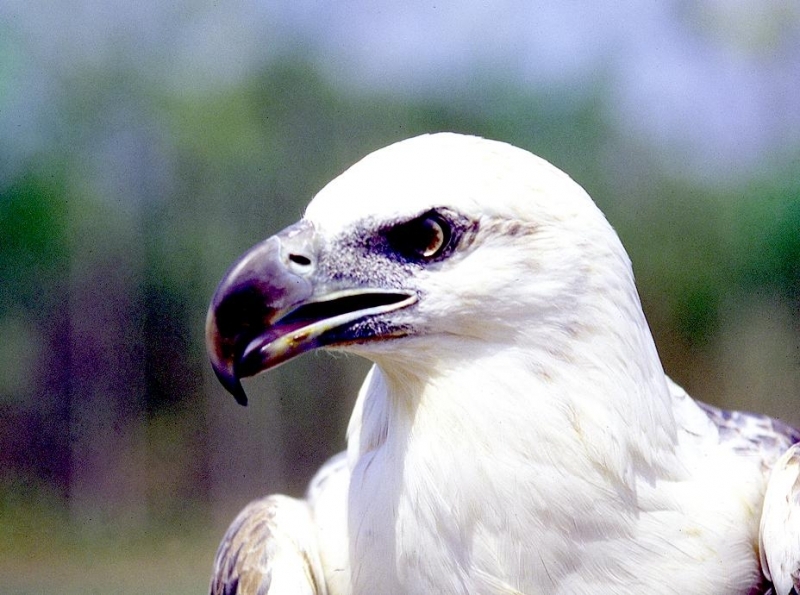 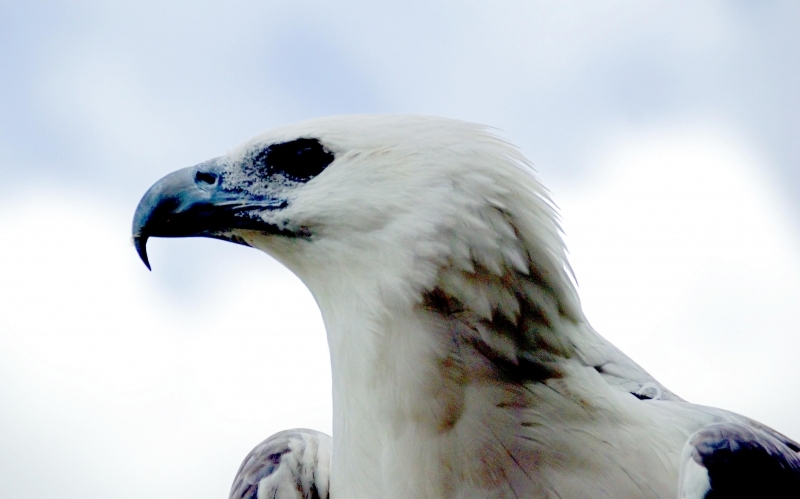 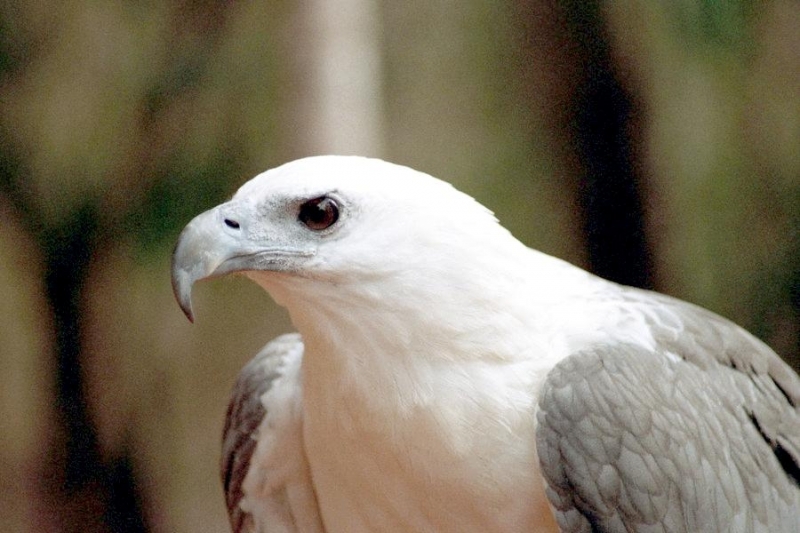 White-Bellied Sea Eagle pairs are monogamous. 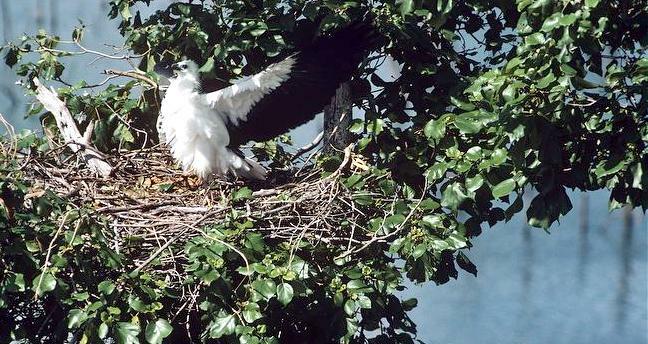 The nest is 1.2 to 1.5 meters across and can grow to be 3.5 meters deep and 2 meters wide with repeated use. 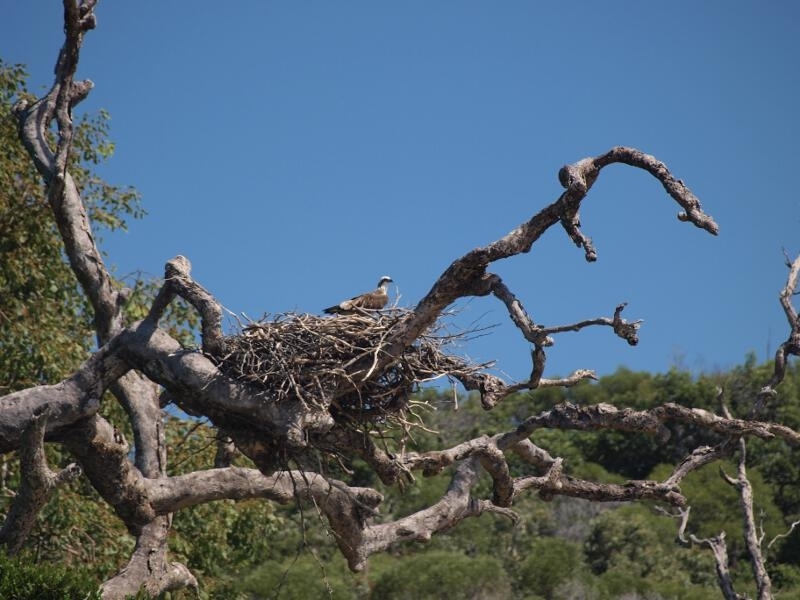 It is lined with green leaves, grass & seaweed and placed in a mangrove or forest tree 3 to 50 meters high; alternatively, it will be built on a cliff 9 to 70 meters high. 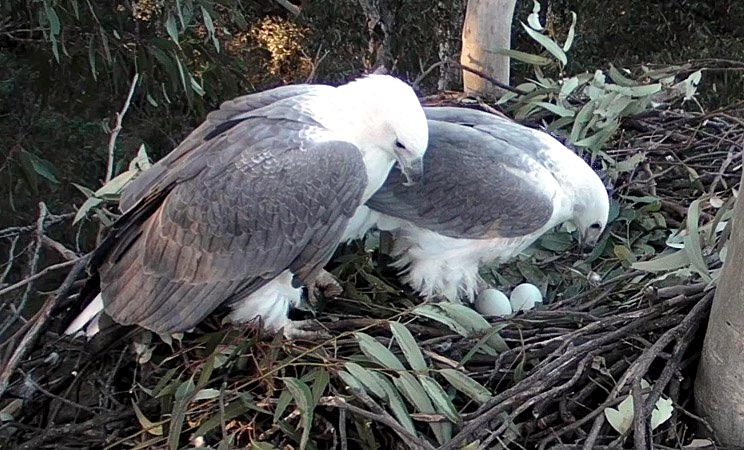 On the average, 1 to 3 dull white eggs are laid & incubated for 35 to 42 days, mostly by the female. 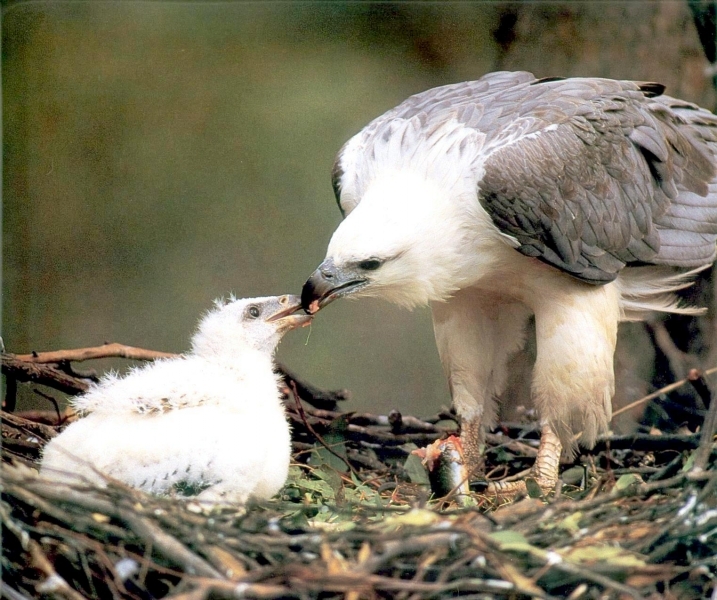 Fledging takes 65 to 70 days and juveniles remain with their parents for 3 to 6 months after that. 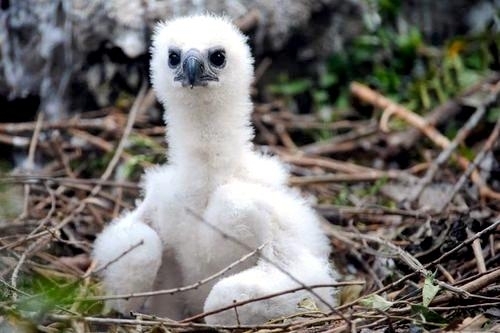 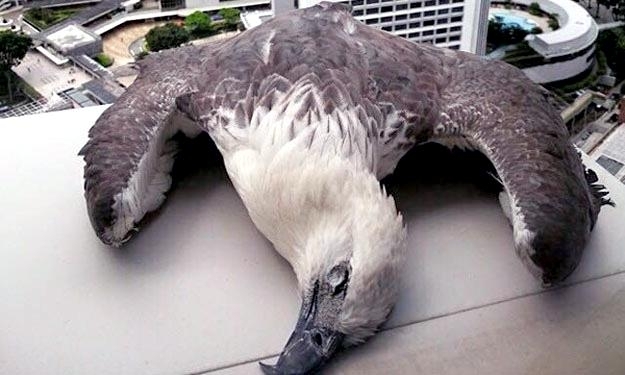 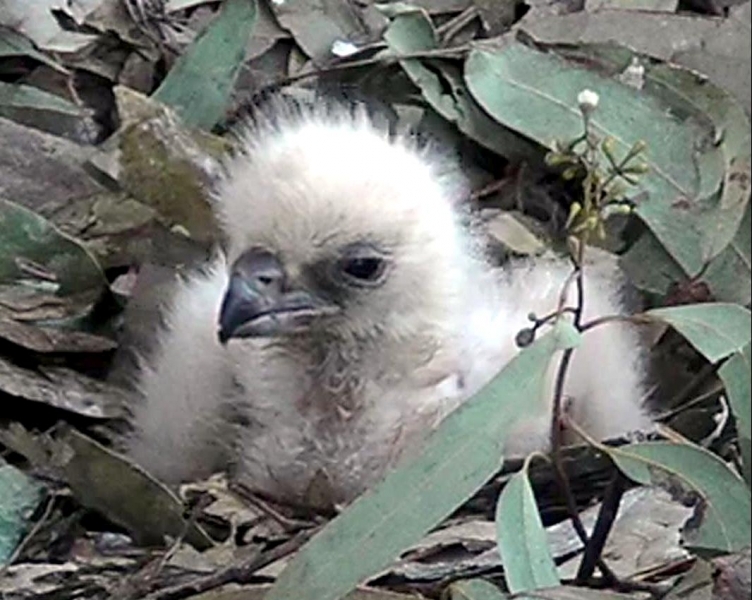 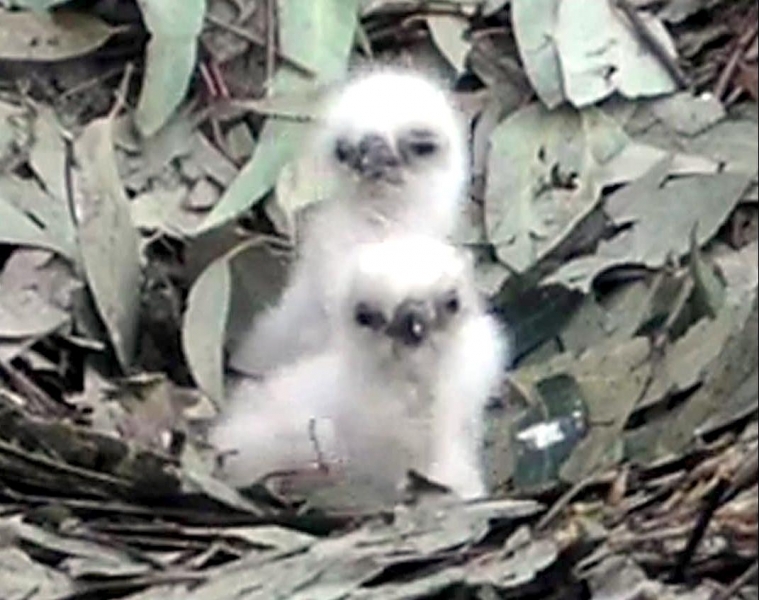 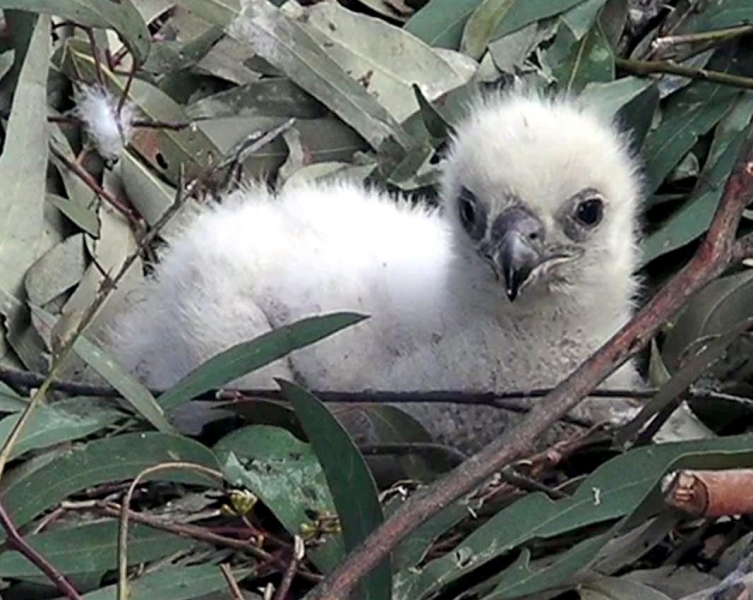 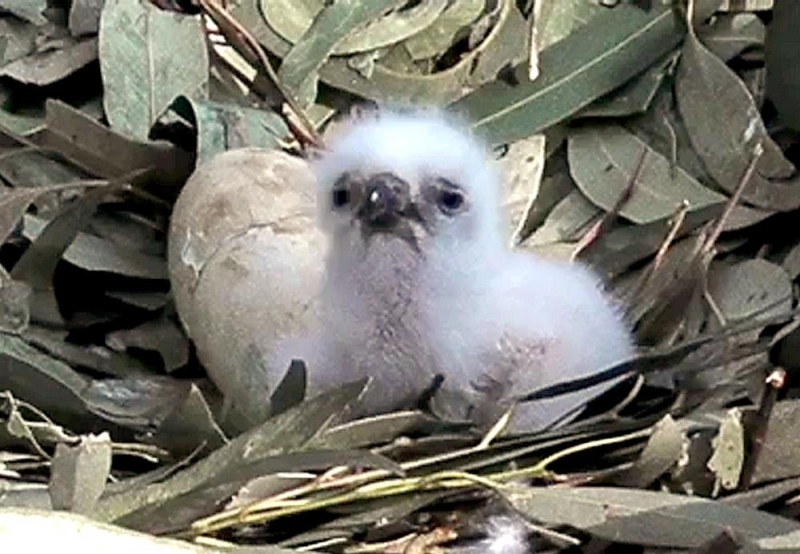 Cainism also known as siblicide (where the older chick kills the younger), is common in behavior in southern China but in Australia, 36% of nesting sites successfully raise more than 1 chick. 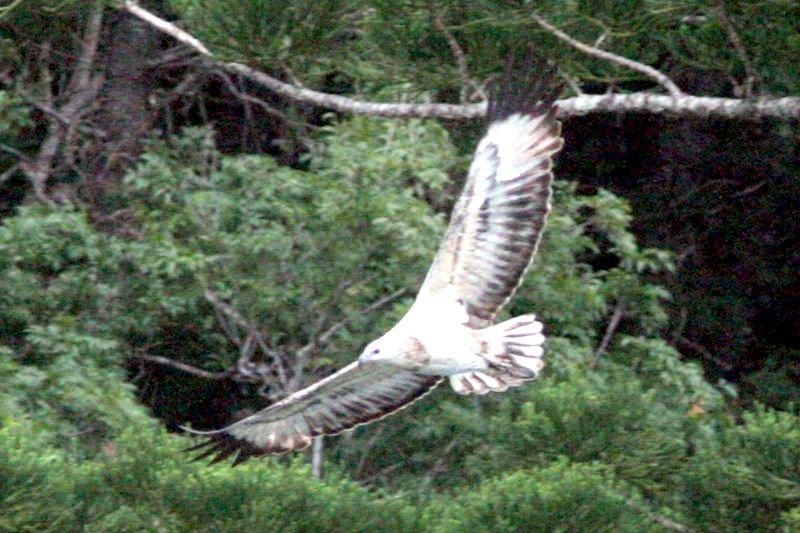 White-Bellied Sea Eagles first breed after around 6 years.